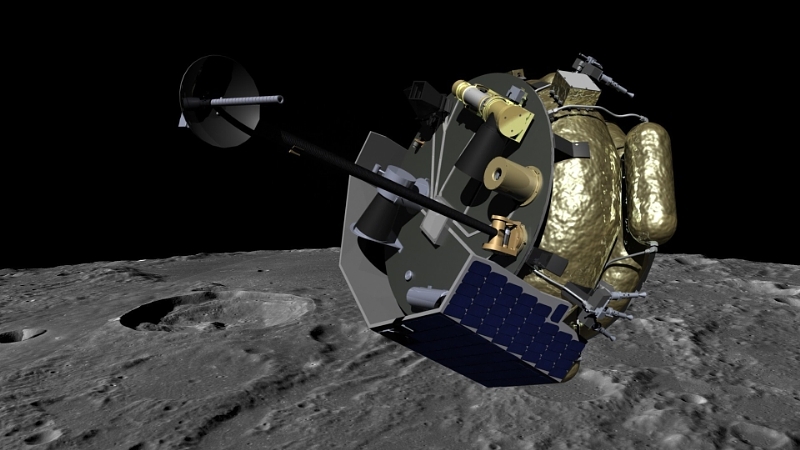 Moon Express MX-1 spacecraft orbits the Moon in preparation for landing. MX-1 will deliver commercial, academic and government instruments to explore the Moon for science and resources. Image Credit: PRNewsFoto/Moon Express, Inc.
August 3, 2016 – The U.S. Government has made a historic ruling to allow the first private enterprise, Moon Express, Inc. (MoonEx), permission to travel beyond Earth’s orbit and land on the Moon in 2017. This breakthrough U.S. policy decision provides authorization to Moon Express for a maiden flight of its robotic spacecraft onto the Moon’s surface, beginning a new era of ongoing commercial lunar exploration and discovery, unlocking the immense potential of the Moon’s valuable resources. Today, Moon Express received the green light for pursuing its 2017 lunar mission following in-depth consultations with the FAA, the White House, the State Department, NASA and other federal agencies. Up until now all commercial companies have been limited to operations in Earth’s orbit, and only governments have sent missions to other worlds. With this landmark ruling, Moon Express has become the first private company approved to literally go out of this world as a pioneer of commercial space missions beyond Earth’s orbit. The federal interagency approval of the Moon Express 2017 lunar mission establishes an important precedent for the private sector to engage in peaceful space exploration, bringing with it monumental implications for the advancement of technology, science, research, and development, as well as commercial ventures that expand Earth’s economic sphere. The framework of the interagency approval surrounds Moon Express’ proposed ‘Mission Approval’ arrangement that utilizes existing payload review and launch license processes under authorities of the Secretary of Transportation, and adds to them a series of voluntary disclosures intended to provide the Federal Government with sufficient information to help fulfill its supervisory obligations under the Outer Space Treaty. The company submitted its historic application for a 2017 commercial lunar mission to the Federal Aviation Administration (FAA) on April 8th, 2016. The authorization of the Moon Express flight to the lunar surface was hailed by the Space Foundation as a significant commercial space breakthrough. Although there is legislation under consideration to enable the private sector at large to engage in deep space missions, remaining compliant with international obligations under the 1967 Outer Space Treaty (OST) continues to present challenges for commercial operators. “A major milestone has been achieved here for commercial space activities,” said Space Foundation Chief Executive Officer Elliot Pulham. “We applaud Moon Express and the Federal Government for this historic ruling to allow private enterprise to travel beyond Earth’s orbit and more fully open a new era of commercial exploration and discovery. Moon Express was co-founded in 2010 by space visionary, Dr. Bob Richards, billionaire entrepreneur, Naveen Jain, and serial entrepreneur and artificial intelligence and space technology guru, Dr. Barney Pell, with the common vision to be at the forefront of commercial space exploration and innovation. The development of their innovative and scalable robotic spacecraft is designed to radically reduce the cost of space exploration— lifting the veil on the mysteries surrounding the Moon and how its resources can be unlocked and used to benefit Earth and humanity. Moon Express is a leading contender to win in the $30M Google Lunar XPRIZE competition.